Novi Pet Expo Detroit - That Guy with the Birds! What a GREAT Expo again this year! We'd like to thank everyone that came out and stopped by to see "That Guy With The Birds" and to hold the birds. There are a lot of pictures below so if you were there, see if your picture got posted! There are some pictures posted on our Facebook wall also, so be sure to check them out as well! Thanks to Jackie for having us and special thanks to Elaine for her help with the programs! 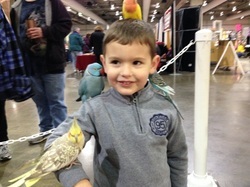 Pictures at The Novi Pet Expo!